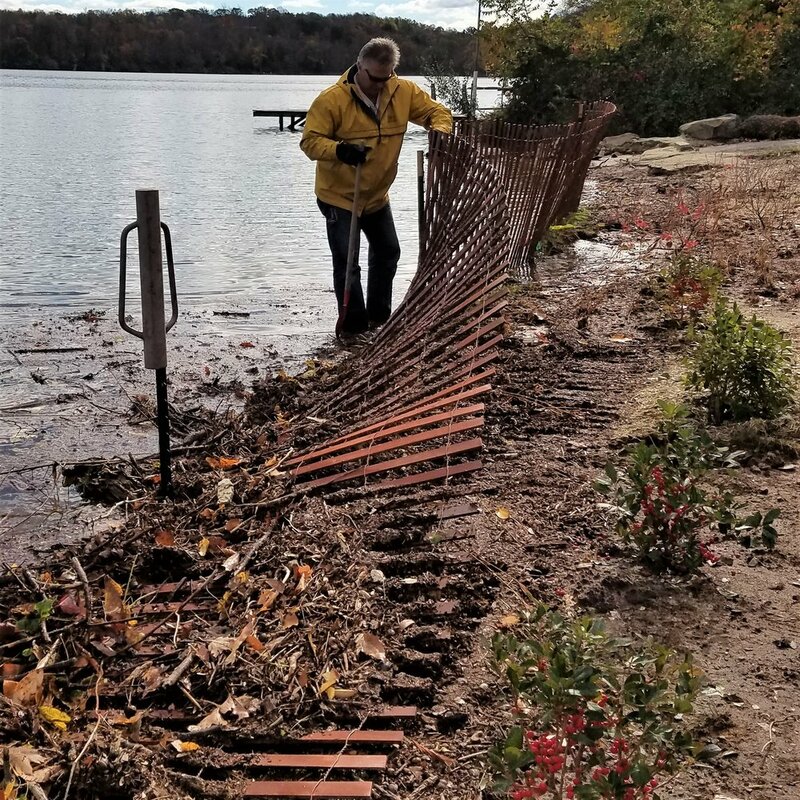 The plan will not only begin to beautify the beach, but provide erosion control measures, and act as a deterrent for the geese that have been making it their home. 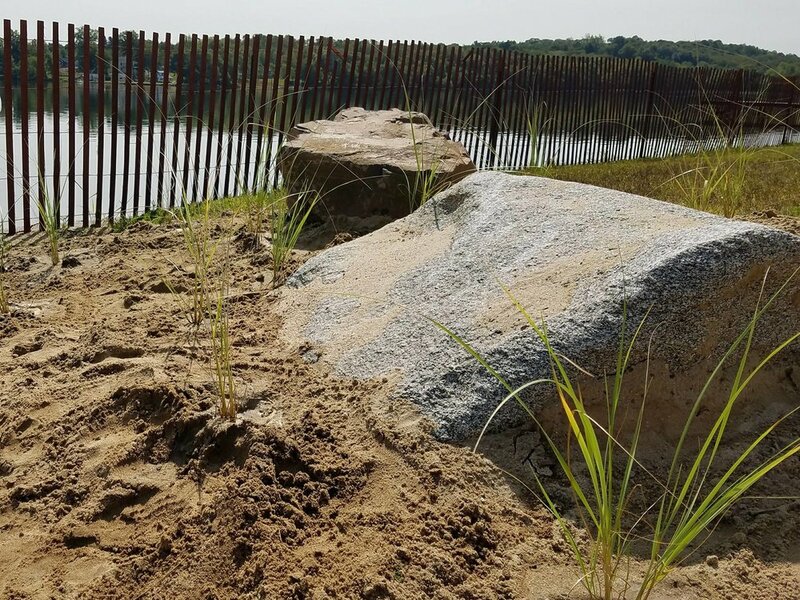 Phase I of the Beach Project began this summer with small additions of Cape Cod style fencing, flag ropes, a sand dune, landscape rocks, and American Beach grass while the master plan comes together. 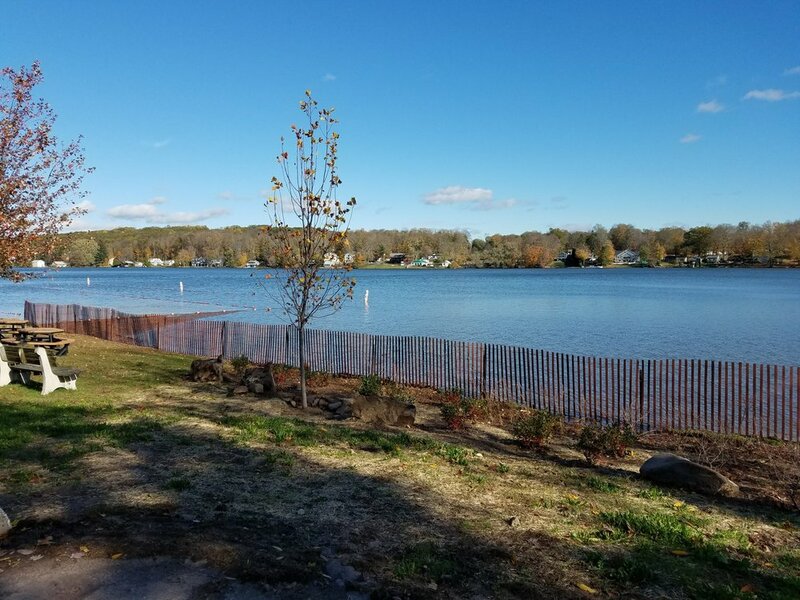 The project is a collaborative effort of the Town of Middlefield, Lake Environment Committee, Middlefield Park and Recreation. Wow, big score today! 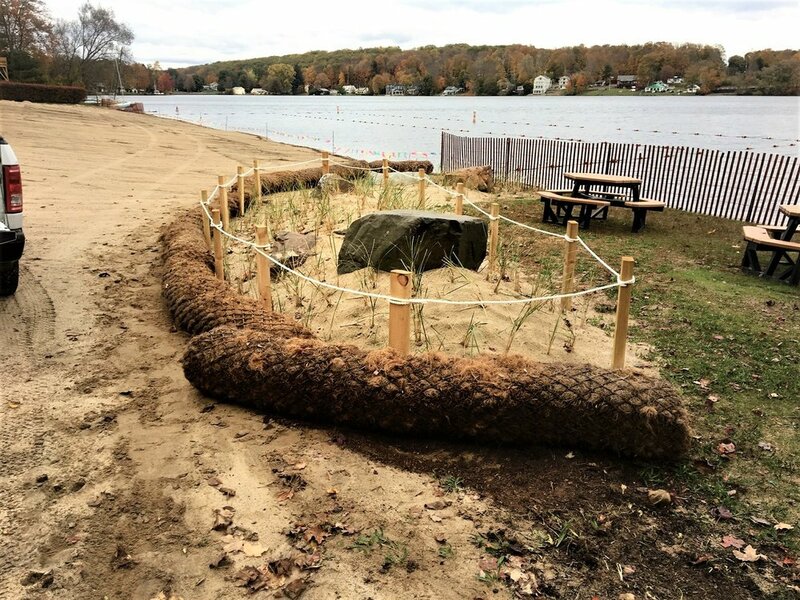 20 Coir logs (biodegradable erosion control logs that will be used to secure new landscapes on the hillside) were donated from a job site for the price of delivery, thanks to the resourcefulness of Kathy Connolly, Speaking of Landscapes, LLC who has been working with the Town on the beach project! A minimum savings of $1,500! 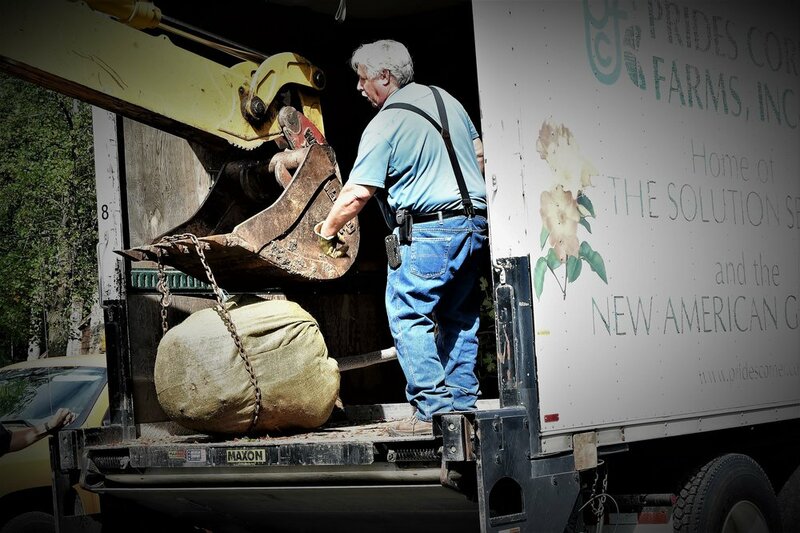 Many thanks to Public Works for offloading, and to the Town for your ongoing investment in our community! 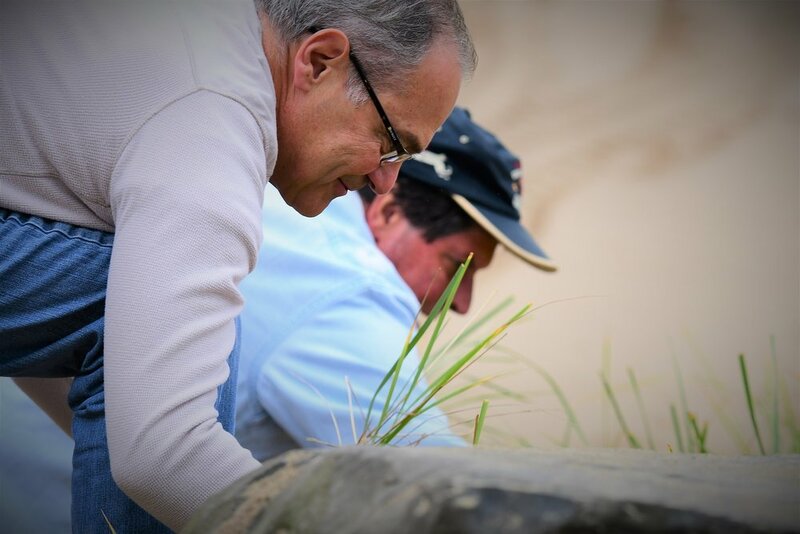 Today, 30 native plants and a tree was delivered and planted at Beseck Beach thanks to the help of several volunteers! 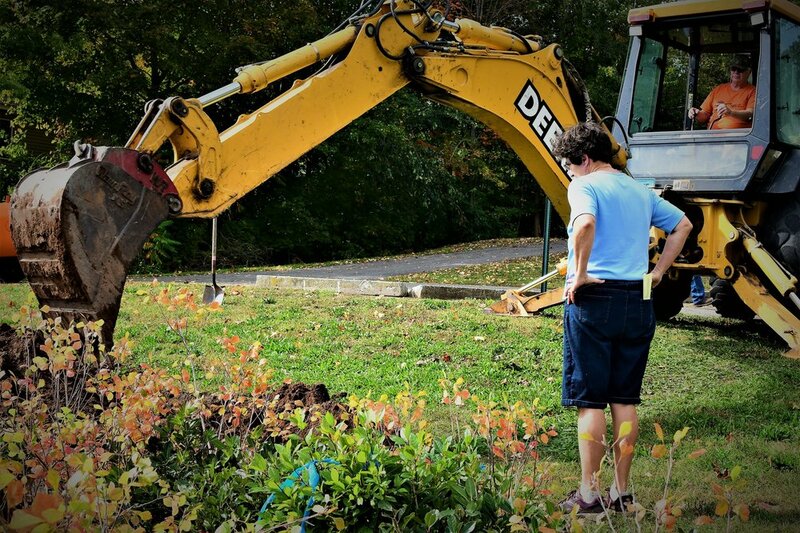 First, a Tulip tree was put in place by Public Works. This tree is a tall eastern hardwood, known for large showy flowers that resemble a tulip. The flowers attract birds, butterflies and hummingbirds. They are known to be insect and disease resistant trees. 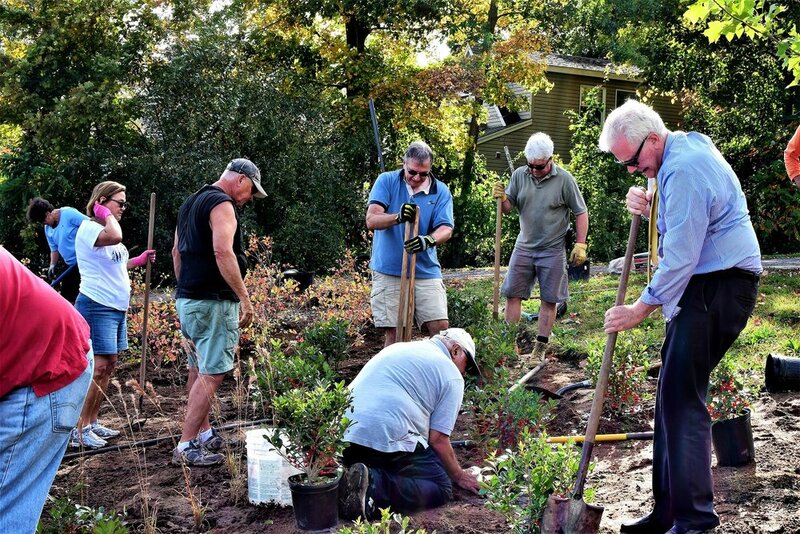 A variety of other trees will be selected to add to the property in the future. Now that's the way to water a tree! Fragrant Sumac, Winterberry, and Bushy Bluestem were also planted. Fragrant Sumac produces fragrant flowers in the spring, and red/orange/yellow leaves in the fall. Berries provide winter food for birds. It also attracts butterflies. Winterberry is in the holly family, it is extremely showy in late fall and early winter when covered with bright red fruit that also supplies birds with winter food. Bushy Bluestem, is a grass. It is blue green in color changing to a coppery color in the fall. Fluffy flower heads resemble chunks of silvery cotton candy. This grass provides nesting material for birds, its seeds supply food for field sparrows, juncos and other songbirds...more will be added soon. Above and beyond that folks jumped in during lunch breaks to lend a hand! 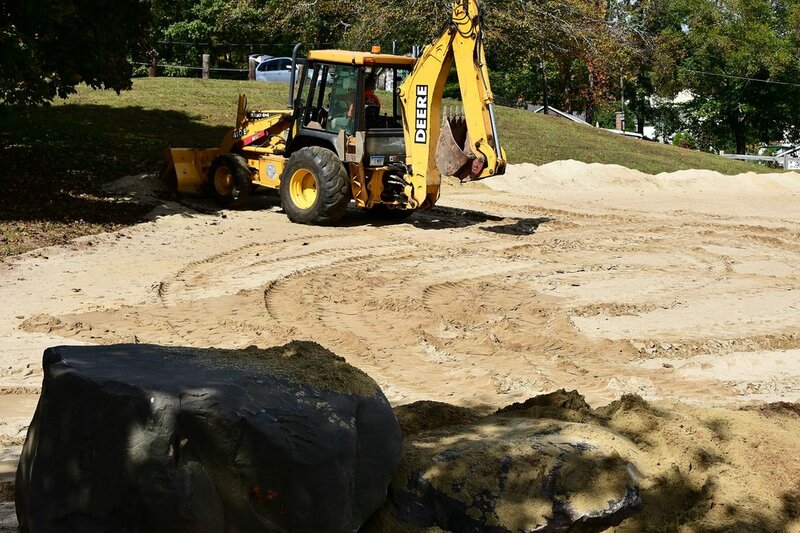 Additional landscape rocks were placed and the small sand dune was extended. 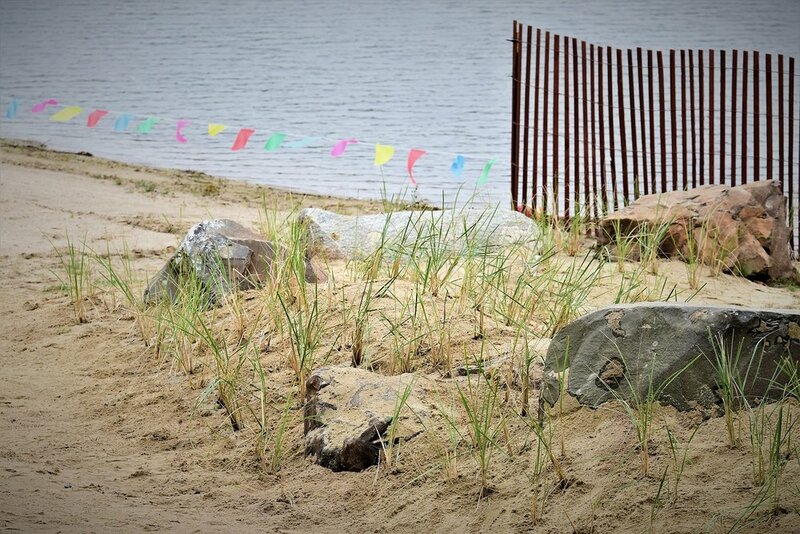 150 more American Beach Grass plantings will be added next week. 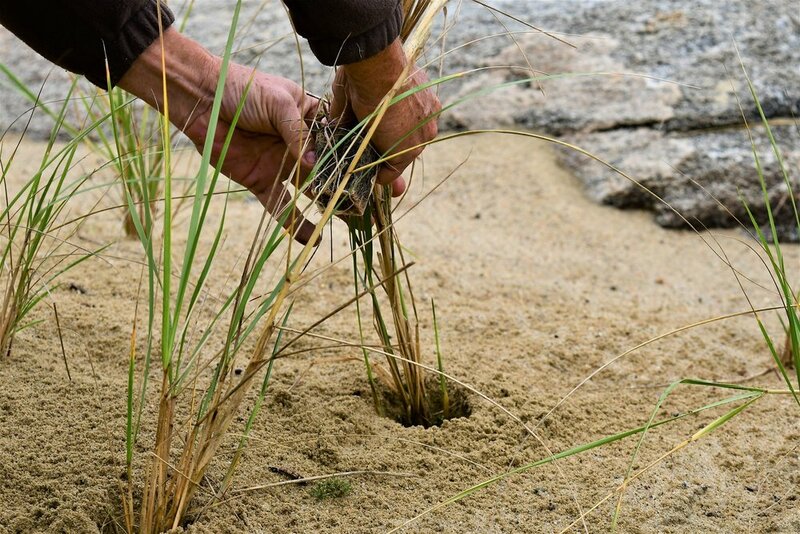 American Beach grass is a dune stabilizer, serving to knit a dune together. 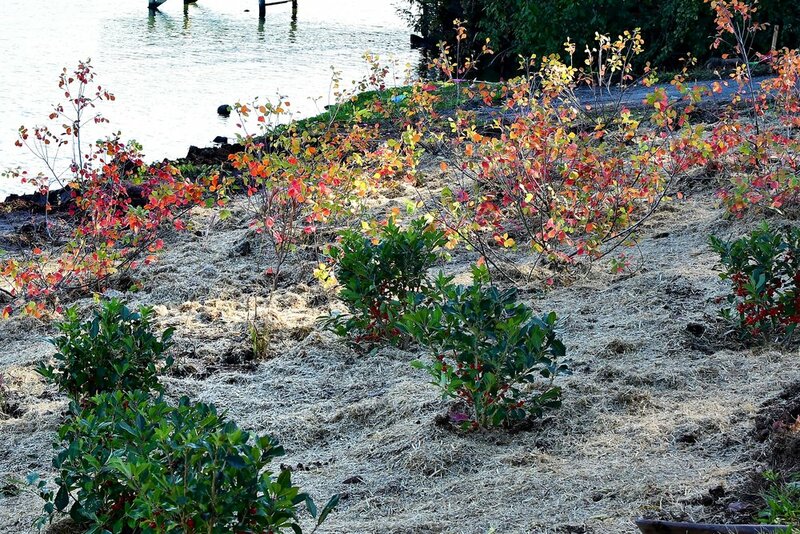 This and other native plants being suggested by Kathy Connolly, Speaking of Landscapes, LLC will help to provide erosion control measures at the beach. 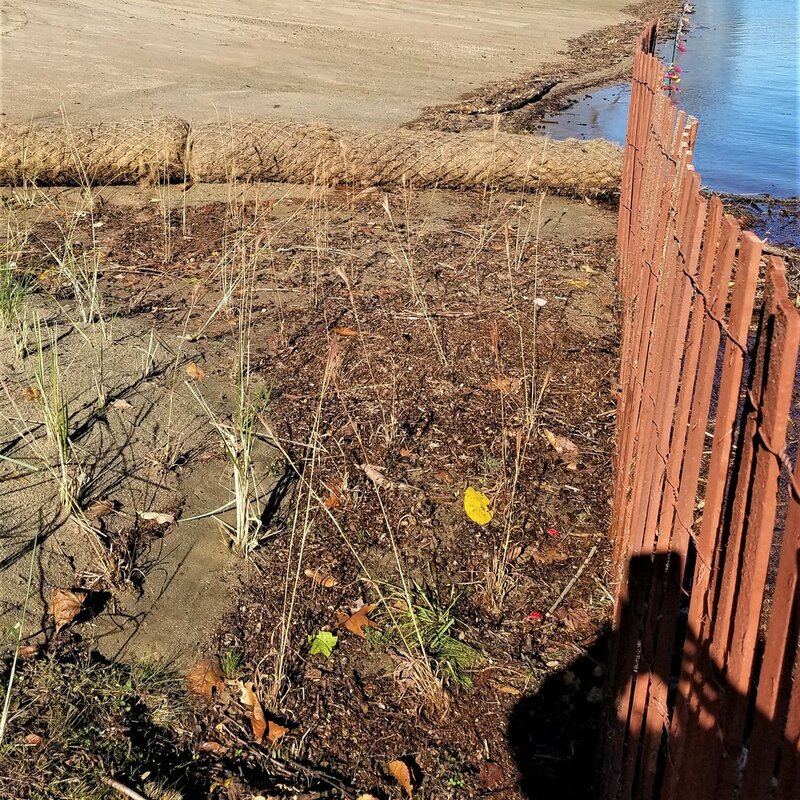 After the plants were put into place, the area of the beach to the side of the ramp was re-smoothed and softened with sand to assist with the launching of kayaks. 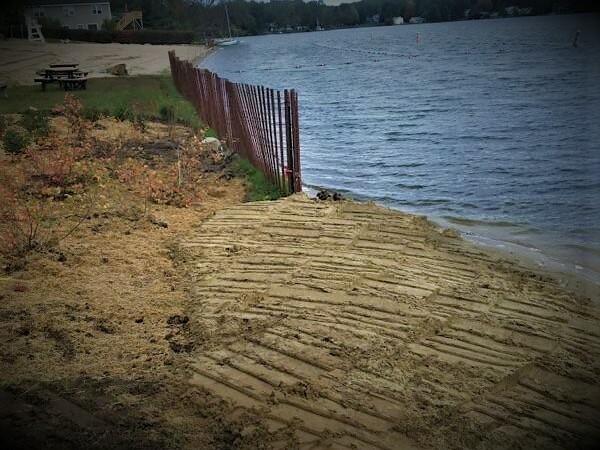 With so much yet to do, the beach landscape continues to take shape with the assistance of a community of helping hands. 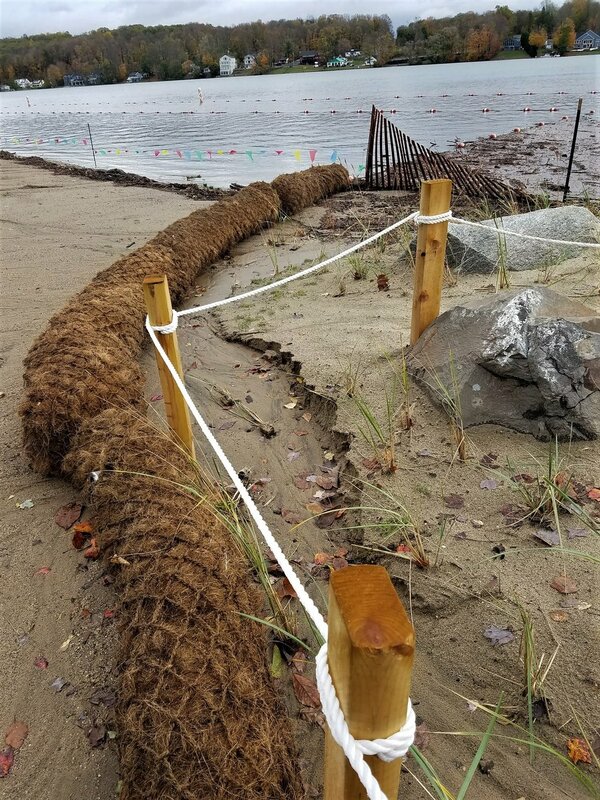 An earlier than expected delivery of the additional American Beach grass is now in place on the extended sand dune as Phase I of the Beach Project continues. <3 our community! 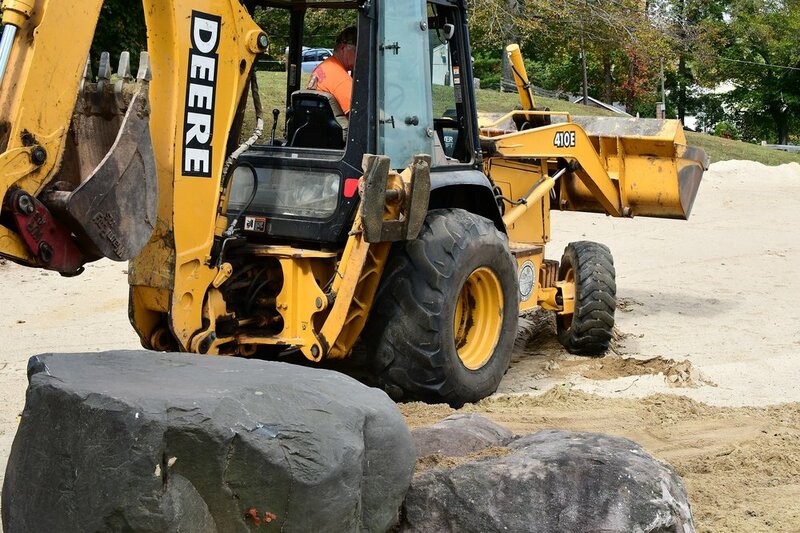 Landscape rocks have now been placed, the south garden is whipping into shape! Today, 250 more plants were placed. 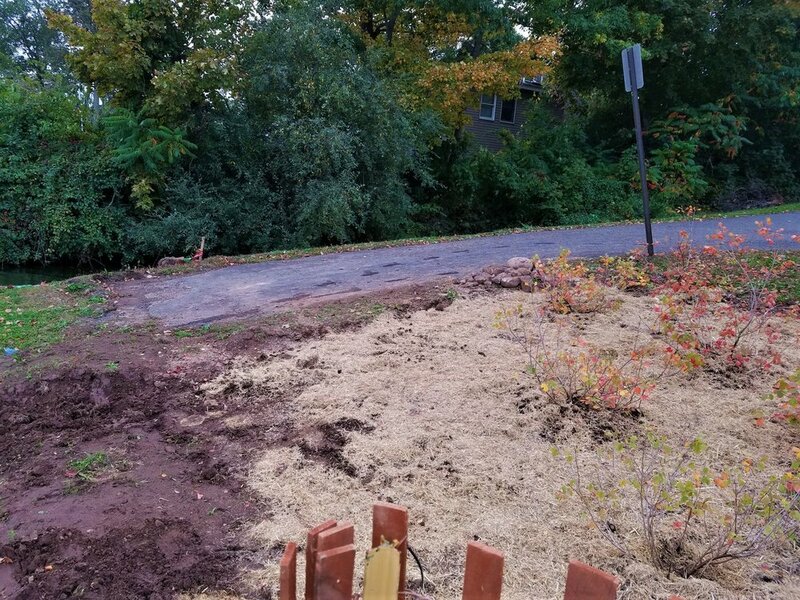 Little Bluestem went into the south garden, Switchgrass was placed along the stream bank, and a mix of Bluestem and American Beach grass went in and around the swale next to the sand dune. A little spot seeding was also done. 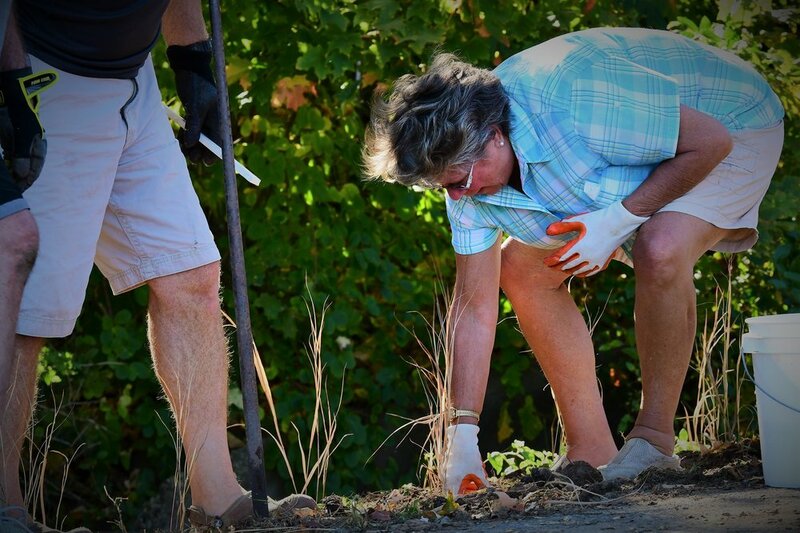 The beach is transitioning quickly thanks to a community of generous volunteers! 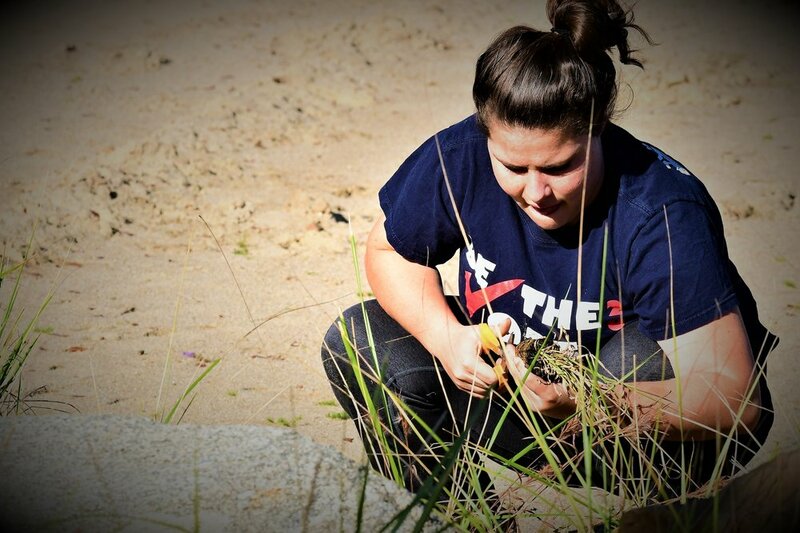 Today, we were able to decorate and protect one of the dunes with timbers and nautical rope. We also gave everything a good watering while we were there! 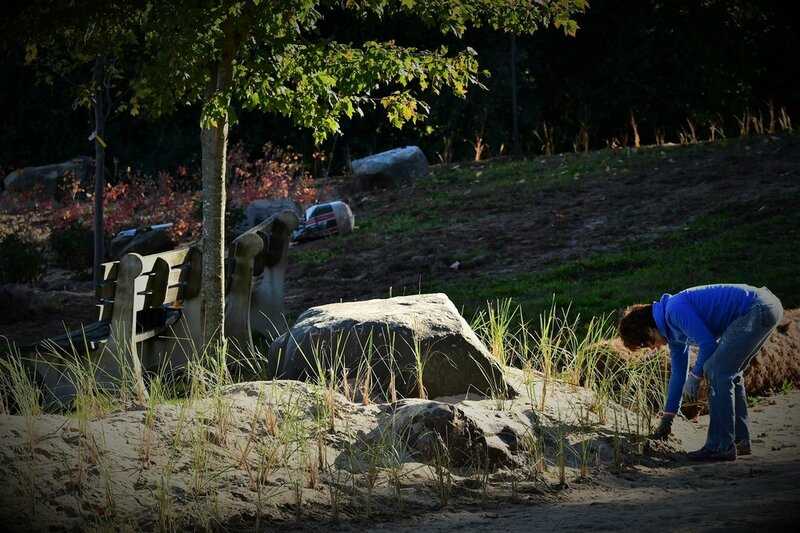 We sadly received reports that some of the grasses had eroded out after the rain storm. We were able to get them back in the ground right away. Coir logs were placed to protect the new plants. Wow, what a storm! Unfortunately, the beach took another hit. Significant erosion occurred throughout the beach. Grass plugs were found laying over with their roots exposed. In addition, the entire goose fence came down on top of many of the grasses that ran alongside. Once again, we were able to get things back into place! 1. 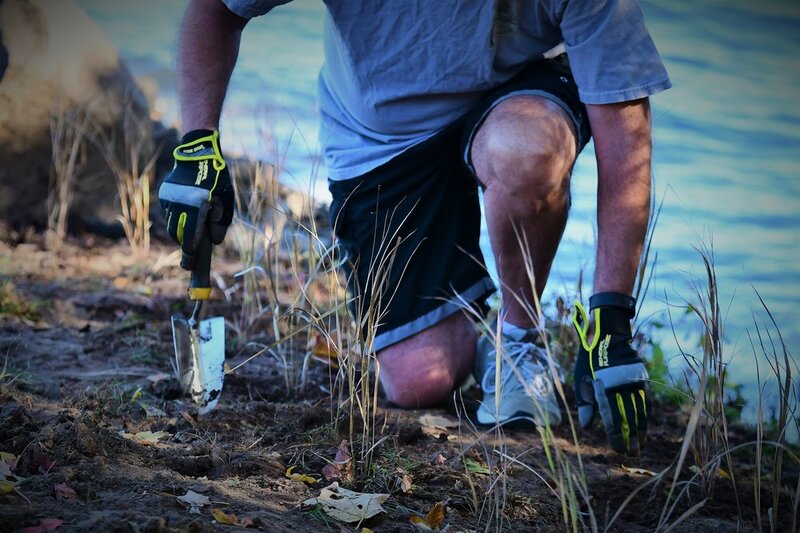 Mitigate and control plant growth to restore and enhance recreational access. colonizing terrestrial species Phragmites australis and Typha augustifolia. attract Red-winged Blackbirds and other “reed-nesting” species. the area more simplistic and fiscally conservative. 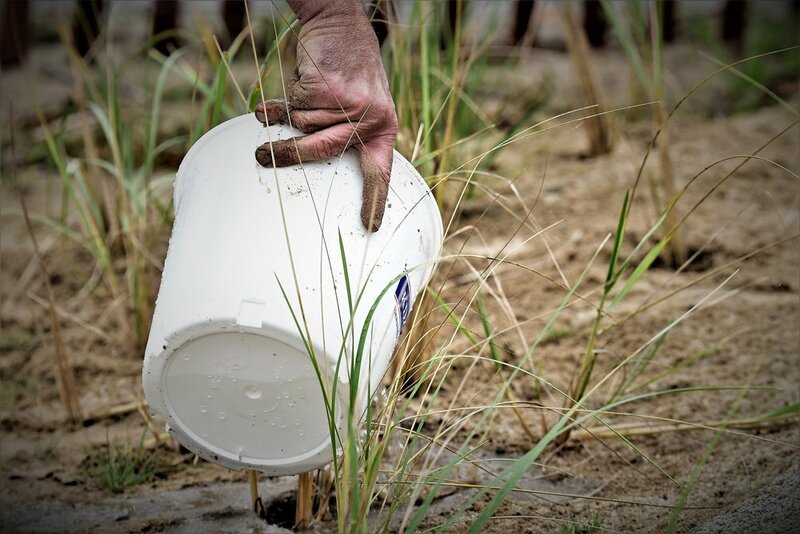 We are scheduled to apply the herbicide Imazapyr to control the populations of P.
carcinogenic, genotoxic, or developmental effects from exposure to Imazapyr. Irene and Ken Angiletta noticed something odd about a Heron that was standing on their deck. "It was standing on our deck for about an hour when he noticed that there was a tangle around its beak". 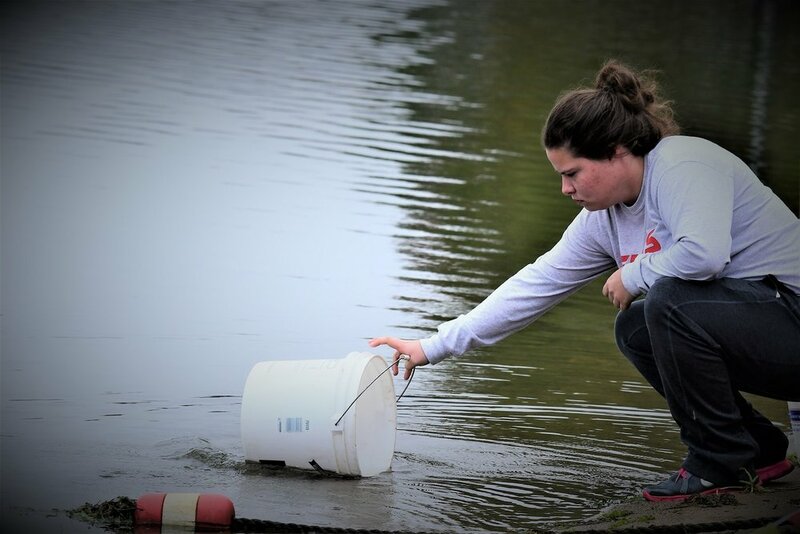 After a call to the DEEP, Wildlife Rehabilitator, Grace Krick arrived to help the entangled bird. "She cut the material which looked like a tangle of carpet and monofilament line. She took the bird in a clothes basket...it seemed stressed after the experience." The Heron went to a Rehabilitation Center called A Place Called Hope, a volunteer group that specializes in Birds of Prey. Unfortunately, Lake Beseck Living learned that the Heron had passed during the evening. The rehabilitator stated that they were unsure how long the Heron went without food or water while it's beak was entangled with monofilament and carpet. Please do your best to protect wildlife by cleaning up debris such as fishing line that could be harmful. Thanks to Mary Ann Mocci who captured footage of the rescue and was kind enough to pass it along so we could share it on Lake Beseck Living. Everyone did their best, thanks for sharing! If you want to learn more about A Place Called Hope, here's a link to their website. Be sure to check out their wish list, as most Wildlife Rehabilitators are volunteers that struggle without the generosity of those that donate to their cause. Over the winter users were told that their centralized mailboxes need to be replaced. Some people were forced to retrieve their mail from the post office due to various issues with the boxes, mainly, the lack of being able to keep these boxes secure. Postmen carried tools with them through the freezing cold temperatures of winter and did their best to keep the boxes secure so they could continue being used. The issues - the back doors of some of the boxes fall off when postmen try to put mail in them, pins and hinges are continuously being replaced on the back access doors and on individual slots, one was hit over the winter, another on Lake Shore broke loose from its post, others are severely rusted and some are not secure from the inside, the mail falls out of the front and back of the ones near the beach due to them being severely tipped. Conclusion, it's time to think about a solution. 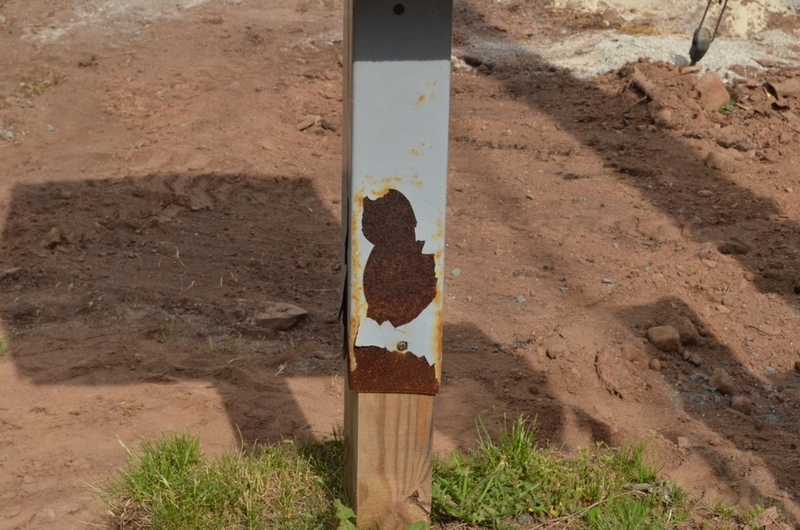 Not only do they look bad, they have become a constant maintenance problem. After much inquiry, the unit replacements fall back on the users , who are considered the owners of the units. The replacement for each unit would be about $1000 or more plus installation, or mail recipients would have the option to move to a P.O. Box and pay an annual fee. Initially, there was not an inexpensive solution other than to get volunteers to try to revamp the boxes with the assistance of the postmaster just to buy some more time, but users were told their life expectancy had really passed. Then, an opportunity came about! Our Middlefield postmaster learned of several units that was purchased by the USPS and installed at a location and then removed only a month or so later! Brand new, hard steel boxes that will last approximately 25 years or so, to replace the plastic and aluminum ones that are currently installed and falling apart! Each of these newer units has 16 horizontal delivery slots and 2 parcel lockers. The only thing the postmaster asked was for users to pour the concrete pads that they will anchor to, in exchange for the FREE mailboxes! The postmaster has agreed that they will anchor everything to the pads and furnish the hardware to do so, plus furnish new locks and keys to replace those not recovered, in addition to the generous USPS investment and donation of the $11,200 worth of boxes. After much discussion, and people stepping up that want to see the boxes replaced, our local post office was able to secure the 7 mailbox replacements, worth $1600 each. The pads that will need to be poured to these specs, 3' x 3' x 4" deep or 3' x 6' for the side by side units, adding up to only dollars if everyone pitches in for materials. The few bucks it will cost to ensure they are secure seems like a great opportunity that will not only keep units where they are, but is by far cheaper than being forced into a PO box or purchasing our own new units. There are over 100 people utilizing these central boxes. Many thanks to the awesome volunteers that have offered to help save these users money and make this project happen! 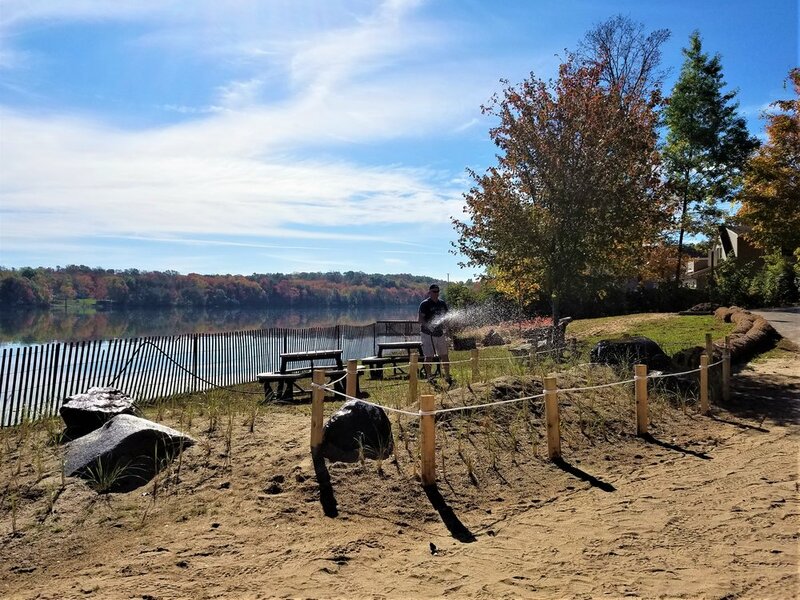 The Lake Beseck Association has been acting as the liaison between lake residents and the post office. 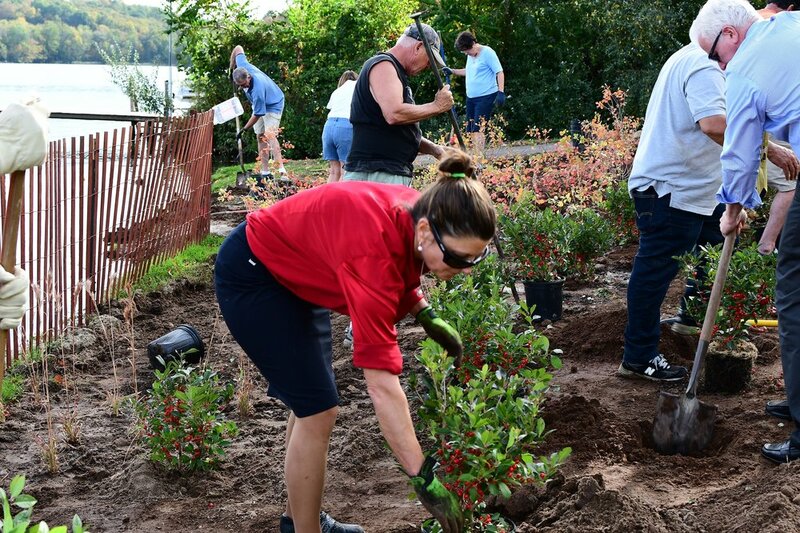 The volunteer initiative was discussed further at a Lake Beseck Association meeting held on Thursday May, 21 at 7 PM where a unanimous decision was reached to move forward with the initiative. All were in favor of the LBA fronting the initial cost for materials. 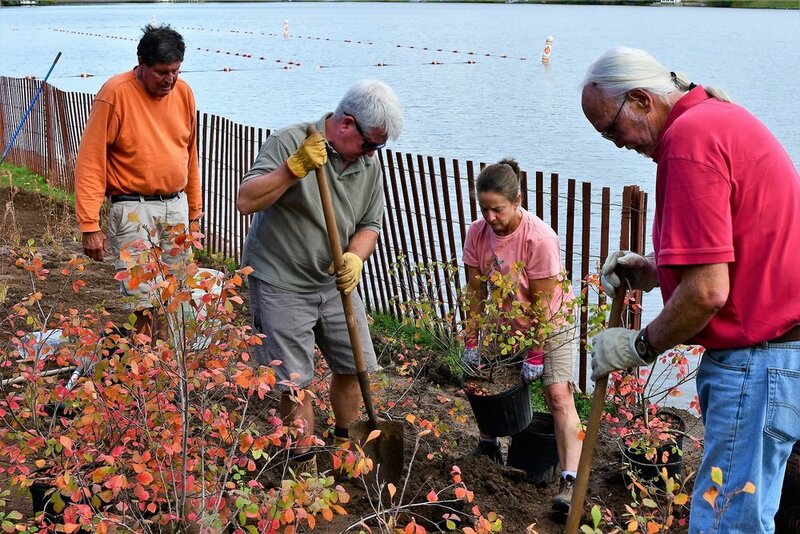 Suggestions were made on how to recoup the expense, such as a donation cup during the LBA picnic, having the postmaster collect money when keys were picked up, and the other thought was that the initiative may encourage Lake Beseck Association memberships. The LBA is asking to help spread the word about the project. More help is needed with digging pads, mixing concrete, pouring the 3' x 3' x 4" concrete pads, quallity control, etc. If you wish to donate toward or volunteer for the project, please respond below or use the "contact us" link.